PASADENA, Calif. -- NASA's Curiosity rover has, for the first time, used a drill carried at the end of its robotic arm to bore into a flat, veiny rock on Mars and collect a sample from its interior. 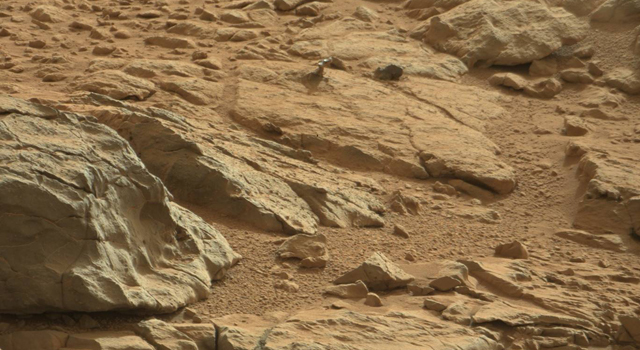 This is the first time any robot has drilled into a rock to collect a sample on Mars. The fresh hole, about 0.63 inch (1.6 centimeters) wide and 2.5 inches (6.4 centimeters) deep in a patch of fine-grained sedimentary bedrock, can be seen in images and other data Curiosity beamed to Earth Saturday. The rock is believed to hold evidence about long-gone wet environments. In pursuit of that evidence, the rover will use its laboratory instruments to analyze rock powder collected by the drill. "The most advanced planetary robot ever designed is now a fully operating analytical laboratory on Mars," said John Grunsfeld, NASA associate administrator for the agency's Science Mission Directorate. "This is the biggest milestone accomplishment for the Curiosity team since the sky-crane landing last August, another proud day for America." For the next several days, ground controllers will command the rover's arm to carry out a series of steps to process the sample, ultimately delivering portions to the instruments inside. 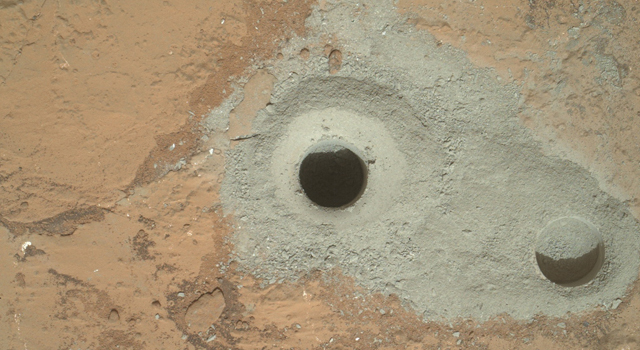 "We commanded the first full-depth drilling, and we believe we have collected sufficient material from the rock to meet our objectives of hardware cleaning and sample drop-off," said Avi Okon, drill cognizant engineer at NASA's Jet Propulsion Laboratory, Pasadena, Calif.
Rock powder generated during drilling travels up flutes on the bit. The bit assembly has chambers to hold the powder until it can be transferred to the sample-handling mechanisms of the rover's Collection and Handling for In-Situ Martian Rock Analysis (CHIMRA) device. Before the rock powder is analyzed, some will be used to scour traces of material that may have been deposited onto the hardware while the rover was still on Earth, despite thorough cleaning before launch. "We'll take the powder we acquired and swish it around to scrub the internal surfaces of the drill bit assembly," said JPL's Scott McCloskey, drill systems engineer. "Then we'll use the arm to transfer the powder out of the drill into the scoop, which will be our first chance to see the acquired sample." "Building a tool to interact forcefully with unpredictable rocks on Mars required an ambitious development and testing program," said JPL's Louise Jandura, chief engineer for Curiosity's sample system. "To get to the point of making this hole in a rock on Mars, we made eight drills and bored more than 1,200 holes in 20 types of rock on Earth." Inside the sample-handling device, the powder will be vibrated once or twice over a sieve that screens out any particles larger than six-thousandths of an inch (150 microns) across. 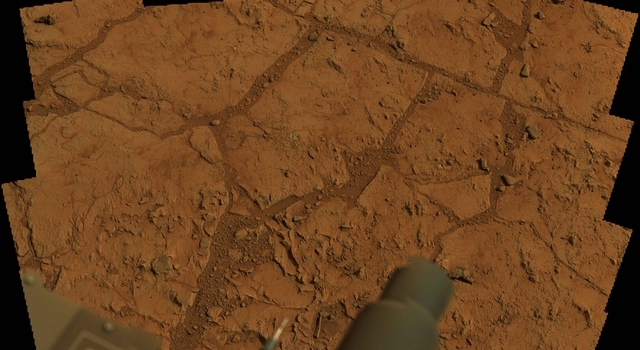 Small portions of the sieved sample will fall through ports on the rover deck into the Chemistry and Mineralogy (CheMin) instrument and the Sample Analysis at Mars (SAM) instrument. These instruments then will begin the much-anticipated detailed analysis. The rock Curiosity drilled is called "John Klein" in memory of a Mars Science Laboratory deputy project manager who died in 2011. 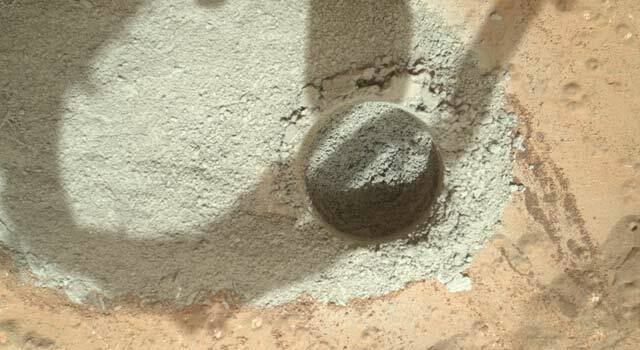 Drilling for a sample is the last new activity for NASA's Mars Science Laboratory Project, which is using the car-size Curiosity rover to investigate whether an area within Mars' Gale Crater has ever offered an environment favorable for life. JPL manages the project for NASA's Science Mission Directorate in Washington. For images and more information about the mission, visit: http://www.jpl.nasa.gov/msl, http://www.nasa.gov/msl and http://mars.jpl.nasa.gov/msl/ .